The other day the tot and I got out the paints and spent some time swirling and moving our brushes all around our papers. My daughter was pretty insistent on using one color for covering the entire area. While watching her concentrate, I couldn’t help thinking of the color field modern paintings by Barnett Newman. 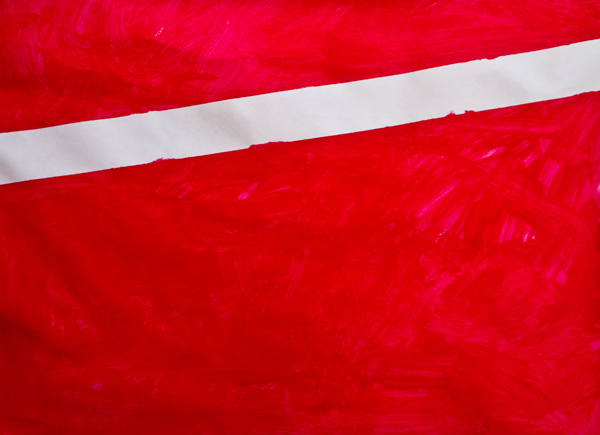 Newman’s famous creations, which he called, “zips,” filled canvases with colors strikingly divided by a thin straight line. He was considered an abstract expressionist and one of the big players in the American color field movement during the late 1950’s. While the tot was busily painting away, I pulled up a few of Barnet Newman’s paintings and shared them with her. She yelled out colors and pointed while I scrolled through the images. This is an ideal project for toddlers, perfect for honing fine motor skills through holding and painting with a small brush and encouraging tots to think of the whole picture – or using the entire paper for creating. Get out a plastic place mat or a few sheets of newspaper, a sheet of white paper, a length of painter’s tape, several small paintbrushes, a small container, and tempera paint. Get your child set up with the place mat – or newspapers – and then place the paper in front of her. 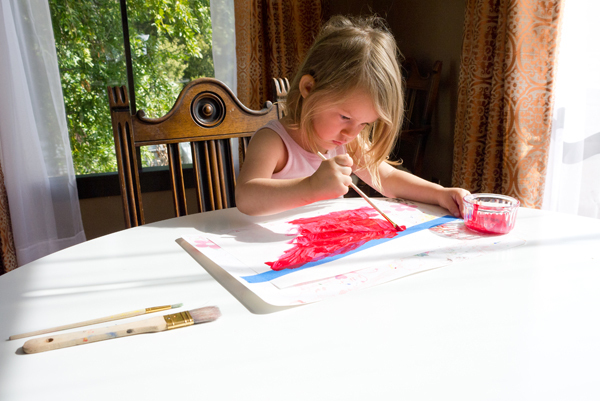 Offer your child a length of painter’s tape that is just a bit longer than the width of the paper. She can pick the perfect spot for pressing it onto her paper and the place mat underneath. Now your child can select which color she’d like to use for her Newman inspired color field painting. My tot yelled out, “RED” and red it was. I squeezed a bit into a small container and got her set up with a few different sized paintbrushes. 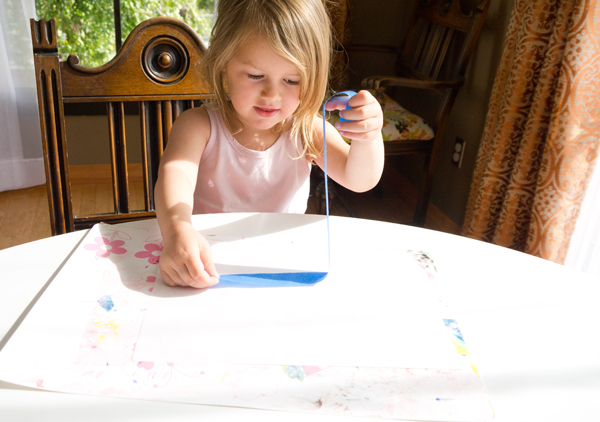 Encourage your child to swirl and move her paintbrush all around the paper, covering the entire area. This takes a bit of concentration – and motivation, so sit on down and keep your tot focused on creating a solid paper full of color. Kids at this age love to scribble away, which is exactly what this abstract art activity is all about, except with paint! Once the entire paper is covered, let things dry before inviting your child to carefully peel of the tape. Now your child can make another exciting abstract color field creation using two pieces of tape – or three – and as many colors as she’d like. Display the finished creations together showcasing the big areas of color.